The built-in BTL amplifier doubles the audio output power and the large 40mm speaker delivers loud audio to receive all calls under noisy environments. Even when using an optional speaker-microphone, the BTL amplifier output increases the audio output from the external accessory connector. The IC-F3261D series provides rugged protection against dust and water that is equivalent to IP67. The IC-F3261D series can withstand 1m depth of water for 30 minutes and its dust-tight construction shuts out powder dust, sand and other objects. 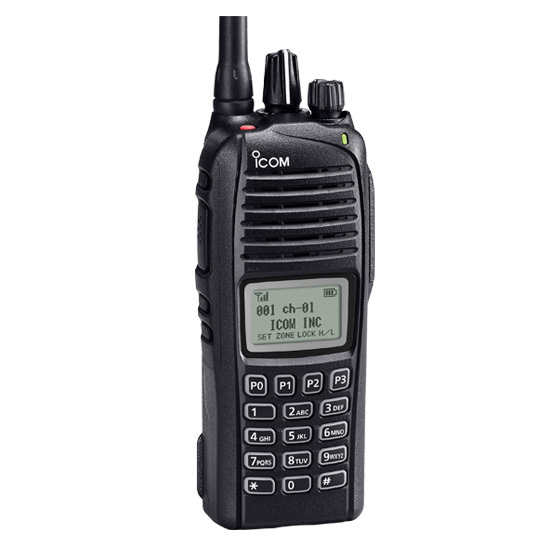 The built-in GPS receiver* offers a position reporting function which sends your current position information to other IDAS radios or dispatch stations at regular intervals or preprogrammed timing. * Available on specific versions. The man down function* automatically sends an emergency signal when the transceiver is left in a horizontal position for a preset period. The lone worker function also can transmit an emergency signal when the radio is not operated for a preset period. These emergency functions can be used to alert your co-workers or dispatcher to any potential trouble. The IC-F3261D series provides NXDN™ CAI-based IDAS digital mode operation. It is also compatible with NXDN™ Type-D multi-site and single-site trunking. The following IDAS features are programmable.